“Birds of a feather flock together.” How is it that various flocks of birds fly together in non-linear formation? How exactly do they communicate with each other to cut and cross paths in synchronized patterns? Is there a captain or a conductor or a coordinator? Do zigzagging birds rotate those roles of captain, conductor, or coordinator, like geese flying in a more linear V alternate as leads and followers? What exactly provides the connective tissue that molds together the mass of modulated majesty? How could we “school people” learn to mimic the great flocks of birds that swarm together in tight, rhythmic formation? Biomimicry may be the way of the future, especially if we hope to innovate in the sustainable manner in which natural organisms innovate in response to their surrounding, environmental changes. In schools, we would do well to investigate and study the lines of flight that reveal a more organic pattern of collaborative learning. Then, Reilly switches to a second meandering and explains with a humongous string of comma-connected items that a line of flight is something like a tracer as “learners traverse and abandon, producing maps of their learning as they move.” (Reilly, “Reimagining Learning as Lines of Flight,” n. pag.) Certainly because of Reilly’s magnificent images that accompany her text, I am able to imagine more accurately the hypothetically traced path of a flying bird – serving as metaphor for the complex flight pattern of our typical, non-linear learning. I can see the hatch-work of tangled mess that really is no mess at all. In the section #6 of this post – “Reimagining Learning as Lines of Flight” – Reilly provides Maria Tamboukou’s diagram of “nomadic trajectories,” which further support the visualization of a line of flight for some winged creature such as a darting starling or meandering martin or frenetic finch – analogously representing the lines of flight we humans take as we move through a day, a week, and a month of interconnected, “messy” thinking and learning. What a gloriously beautiful tangle those lines of flight can be. 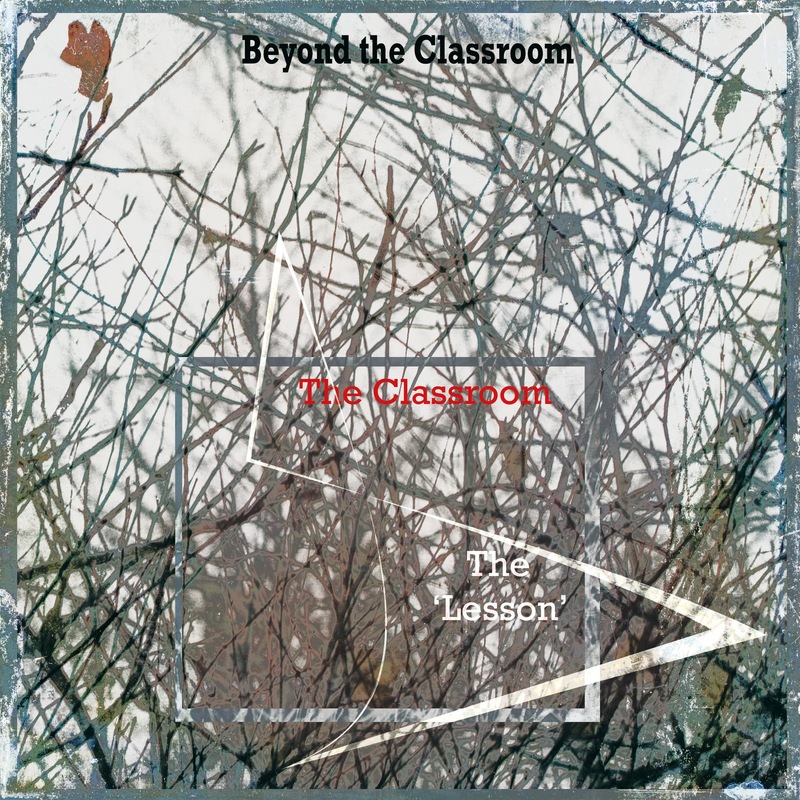 How do we attend to the creative impulses of learners that occur outside the domain of the school and challenge binary ways of knowing—ways we might well be situating as truth? What types of environmental and pedagogical considerations might be necessary in order to leverage/cull/come to know such thinking? How might we ‘carefully’ come to know and invite in (if possible) these lines of flight within the classroom and/or the ‘sanctioned’ learning? How often do we stop and acknowledge how little we know about our learners’ learning lives beyond our purview? How might lines of flight de/colonize classrooms? How do lines of flight engender inquiry as opposed to categorization? All knowing is constructed. How do lines of flight offer us a method to reduce our binary ways of knowing that may overpopulate a classroom? Because of the visual organization of Reilly’s blog, these stirring questions seem almost to grow – to rise in flight – out of a foundational image produced by Reilly, and the image captures the real essence of our foolishness that learning is in any way bound by the four walls of a classroom – proverbial or real. If we are not mindful, our classroom thinking can trend toward thinking inside a box – literally and figuratively – as we categorize thinking into neatly bundled packages called math, science, English, and history. But are we really doing all we can to catalyze genuine inquiry in our young learners that we label as students? Are we encouraging the zigzags of natural lines of flight – the biomimicked version of a bird on the wind? Do we nourish questioning and integrate outside-of-class thinking, or do we squelch such because we have so much to cover in 180 days? What wonder might emerge if we school people acted more as travel agents or air traffic controllers who coordinated various trips and travels than if we kept the planes in the hangers of our cordoned-off sections of tarmacked airports? Throughout Reilly’s posts, though, I tended to picture a single, solitary bird flying in zigzagged lines of flight, following such a tracer path as that white lightening bolt included in the foundational image emblazoned in Reilly’s “Exploring Lines of Flight at School (and Not).” But I am more interested in FLOCKS of birds – how hundreds and thousands of birds can fly together in synchronized patterning…like those starlings on Otmoor in the YouTube video that opened this post. Holds those thoughts for a moment. I promise to return to them, but I must tell another story…such is my zigzagging line of flight. Upon much reflection, I absolutely agree that all school leaders should willingly and enthusiastically be taking on the mantle of innovator. However, from working with a division full of innovators for the past several years, I see that we can all be like those lone starlings, martins, or finches. Even with care taken towards collaborative work habits, we school people can tend to return to our classrooms and fly our own individual flight patterns – our silo-ed lines of flight. Occasionally we might intersect; in fact, we are likely to intersect. But these intersections are often chance encounters facilitated by serendipity and chance more than by planning and intent. What if we flew as a flock? What if we became more birds of a feather? What if schools of the future steered more purposefully toward the future of schools by coordinating the lines of innovative flight? I do not mean to create irony here. I am not calling for standardization of practice, and I am not meaning to disqualify that “continuous variation and free action” that Wood and Brown defined as the creative movement of a line of flight. However, I am wondering what we school people might be able to accomplish by way of navigating more as a flock, moving in a mass of modulated majesty. Yes, we should all play our own instruments or positions, but how are we coordinating and strategizing our play? Would an orchestra be able to create its majestic music without the swirlings of a director or conductor? Would the music sound as melodic or sweet? Would a football team be able to function as a coordinated whole, composed of unequal parts linemen, running backs, wide receivers, and quarterback, without the expert coaching from an offensive coordinator? Would the game be as purposefully exciting? Who serves in the comparable role for a school? Who weaves together the complex lines of flight of the creative masters of education – the teachers – while employing a determined focus to research and development…along a roadmap of intentional travel? Is it the school head? Is it the principal? Is it the curriculum coordinator? The department chairs? The superintendent? Can the people mantled with those titles and responsibilities devote enough majority attention to R&D and strategic, systemic innovation? But, in each case, notice where that apostrophe accents. That precise punctuation calls attention to the singular possessive. What if we moved that apostrophe to the outside of the letter S, and what if we forced the plural possessive? Has the book been written that tells us of how we might fly as a flock by embracing and empowering the innovators’ conductor? 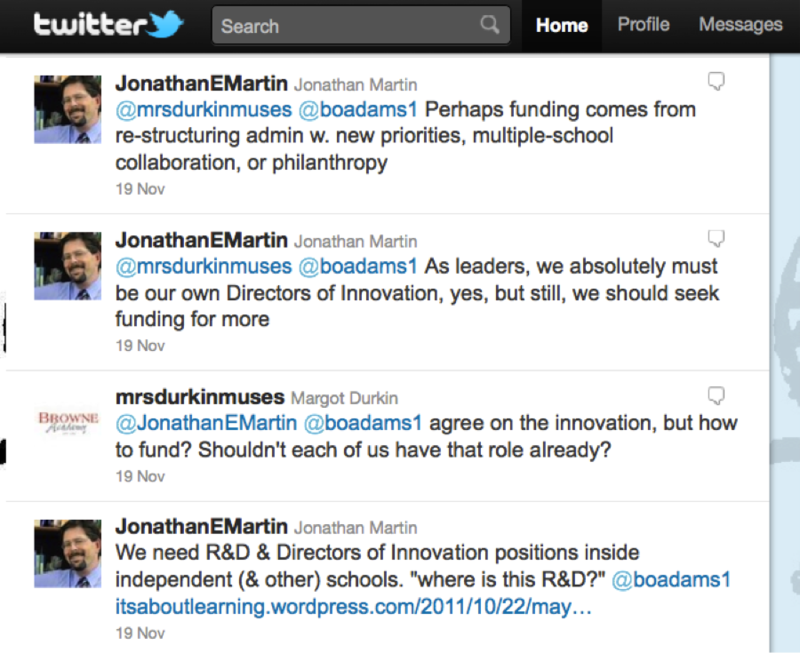 The innovators’ coordinator? The innovators’ connector? The innovators’ director or strategist? However, both of my very respected colleagues, Martin and Ferriter, may still remain as in-satiated and still-curious as I am about how to actually serve as an orchestra-like conductor or an offensive-like coordinator for directing and coaching a mass of modulated majesty of ENTIRE SCHOOLS acting as FLOCKS in such synchronized innovation. Is it enough to inspire and motivate a school-full of innovating teachers and staff? Most certainly, to inspire and motivate such is a fabulous and necessary start. But it is my experience that these innovations often remain segregated by walls that separate math class from science class, as well as by those that separate English class from history class. 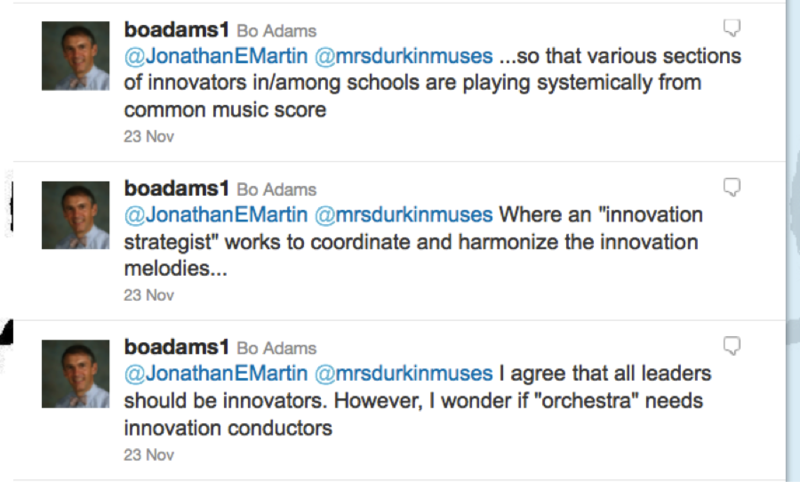 Like the sound waves that blend in the airspace surrounding an orchestra playing a symphony, and like the commentated, chalk-line routes that define a football team working in offensive harmony, how do we blend and harmonize the departmentalized learning that is occurring in most disciplined classrooms of specific, segregated subject matter? Schools of the future must assuredly be tearing down walls that prevent such blending and harmonizing. And when we do, we must work as educational leaders to ensure that the resulting sounds, coming from previously impermeable containers, combine in reinforcing frequencies rather than in cancelling frequencies or noisy cacophonies. We need to work to make beautiful music. I’d like to schedule a trip to that whole-school destination! I would like to trace that line of flight! How do all of those starlings on Otmoor know to turn, gee, and haw together?! How do they conduct their coordinated flight? How do they mold into that mass of modulated majesty? How might we “school people” develop that biomimicked synergy? On to fly…in the zeal of zigzags…as a member of the flock, not alone. Reilly, Mary Ann. “Exploring Lines of Flight at School (and Not)” (http://maryannreilly.blogspot.com/2011/11/exploring-lines-of-flight.html). Between the By-Road and the Main Road. Nov. 22, 2011. Google Reader via Feeddler. Reilly, Mary Ann. “Reimagining Learning as Lines of Flight” (http://maryannreilly.blogspot.com/2011/11/reimagining-learning-as-lines-of-flight.html). Between the By-Road and the Main Road. Nov. 18, 2011. Google Reader via Feeddler. Tarte, Justin. “What do you see…?” (http://www.connectedprincipals.com/archives/4917). Connected Principals. Nov. 20, 2011. Google Reader via Feeddler.